It's a cross-platforms app, so that you can access your information whenever you need and wherever you are. Because you're simply like everyone, struggling to remember all the passwords and other codes that makes our modern life. And you want to gather all this information in one place, but with complete security. oneSafe incorporates the strong encryption algorithm available (AES-256) and all your data is automatically encrypted as soon as it's saved in the app. - Backup options (through email, iTunes or Wifi) to keep the app safe. 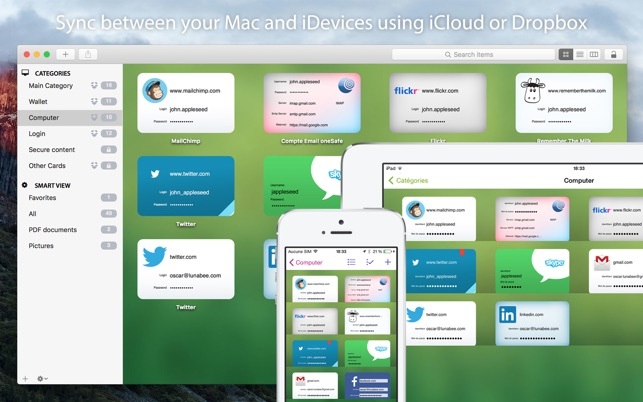 - Dropbox sync of your data between Apple and Android versions. - Customizable categories to keep all your information in order. 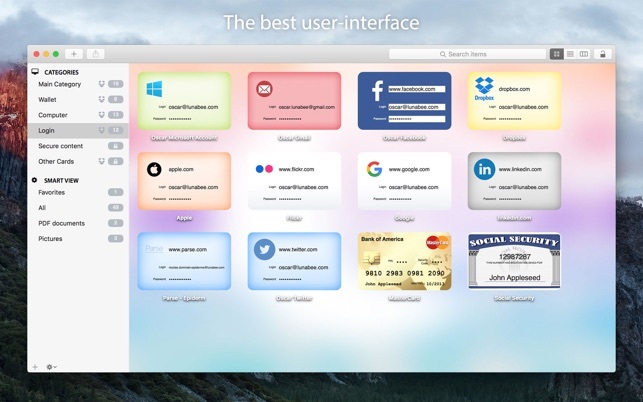 - 'Favorites' highlighting for a fast access to your most used information. - Search capability within your database. 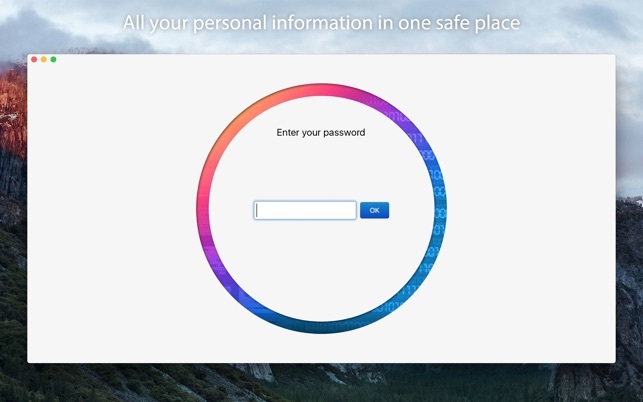 • Why oneSafe and not another password manager? - Because you don't have to provide your email to use oneSafe, you simply need to set up a password, the last one you'll have to remember! - Because there is no hidden fee to use oneSafe. This is a less favorable update to my previous review. Since updating to Mac OS High Sierra, OneSafe’s search feature no longer works for me. One Safe click is completely non functional as well. I was in touch with the developer who offered me *some* assistance in sorting out the problem, but his solution didn’t work. He has since stopped replying to my emails requesting further assistance. I think this app has some great features, but the search feature should be a higher priority. So far this app has performed great, as advertised. 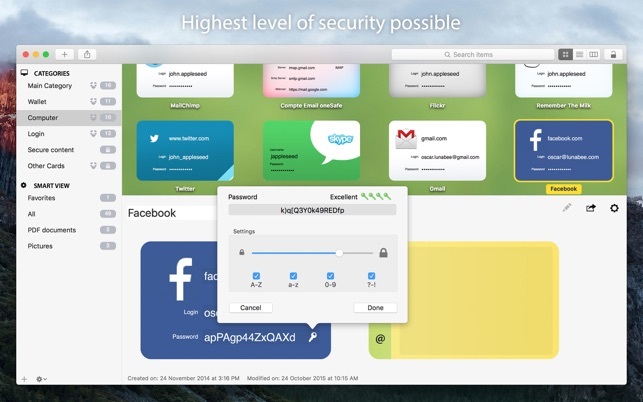 User-friendly interface, efficient search criteria, multiple syncing options across devices (icloud, dropbox) and the latest desktop version has a nice menubar search widget, similar to spotlight but for your passwords. Most importantly, the developer offers email support! I was really shocked to find that there were no obvious places for basic information such as security questions and answers for websites, no places for notes such as when an account was opened, password last changed, etc. Great for basic, absolute minimum information or a little less. For instance, there is only one template available for for medical insurance; medical insurance and even Medicare have more mandatory fields than the only template for this class of insurance. I currently store all of these additional fields and other information such as the phone number, in the password secuity software that I am already using. Love the degree of security and the template idea but so many fields are not there and no obvious way to add them. Where is a field for the name of the bank manager I call when I want to do something while I am out of town? I’ll have to go oneSafe and then to my address book - currently I use the note field in my current product. Will try it since I already spent the $$$ but am entering the process with a very negative view. 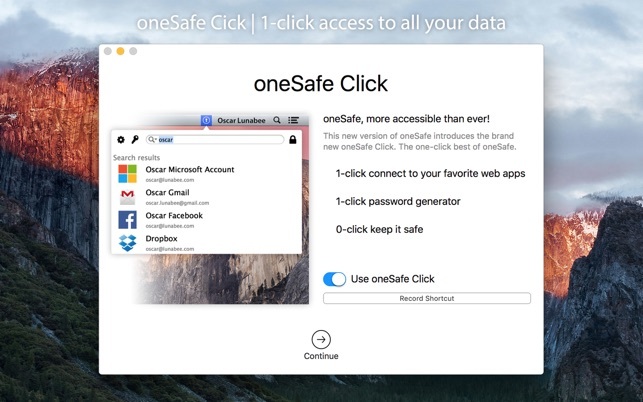 Have been using Onesafe for a few years now and everything seemed to work just fine, until it didn’t. For the first time I tried to contact customer support and their responses were slow and incomplete. Seems like they are either too busy or just dont care. Sad really, since all your passwords are in this app so it is no small issue. Beware that this app will not help you at all if things go wrong, better be able to figure things out yourself or go to another app.